A Kokoba cat litter box carbon filter can help to reduce bad smells coming from your cat's litter tray. Whiffy cat litter trays can be pretty overpowering. If the smell's getting a bit unbearable, a carbon filter can take the edge off. Cats sometimes go to the loo outside their litter box, so that might be adding to the general pong. You can make sure your cat does their business in the right place by keeping their litter tray nice and clean, putting it somewhere private, and keeping it away from their food and water bowls. If the smell is more pee than poo, you might want to consider switching to clumping litter. This pulls the pee together into lumps, so it's easy to scoop out with the droppings. You can also reduce smells by raking through your cat's litter once a day, binning any dirty stuff and replacing it with some clean litter and a sprinkle of baking powder. Change the litter completely once a week, and wash the tray in hot water to kill any germs. If the litter box is still a little pongy (despite your cleaning regime and the charcoal), your cat might have a tummy problem. If you're worried about their smell, it's best to have a chat with your vet. each pack contains three filters (three months' supply). Activated charcoal is really great at absorbing bad smells and bacteria. If you put it next to something that smells really badly, it'll absorb the worst of the odours so your nose doesn't have to. That's why it's used in litter box pads like these ones. 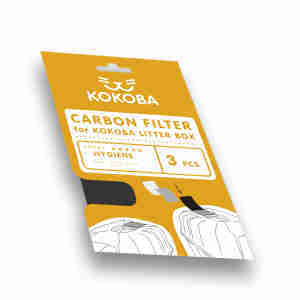 You can slot these carbon filters straight into the Kokoba cat litter box, which has a special space for them. Pop it in and you should notice your home smells a bit fresher. If you have one cat, change the filter once a month. If you have more, you might need to change it more often (your nose will keep you updated).